Give someone the gift of the real Rodizio experience. When you purchase a Gift Voucher for Estabulo, an electronic gift card will be emailed to you or to the person you are buying the voucher for. Until you receive the voucher via email you will not be able to redeem the voucher in our restaurants. 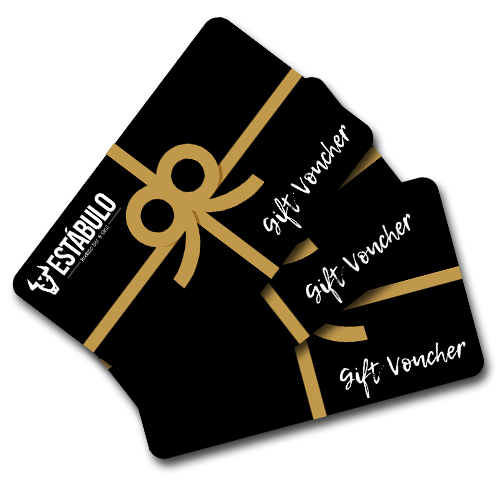 Estabulo Gift Vouchers can be redeemed and any of our locations. Buying as a gift? No problem just fill out their details and we will send the voucher directly to them. Please allow 48 hours for vouchers to register in our system, during this period the vouchers will not be able to be redeemed in our restaurants. 1, All vouchers are to be redeemed in UK Restaurants only. 2, We only provide electronic gift vouchers which are supplied via a given email address. 3, All vouchers are valid for 12 months from the date of sale. Vouchers not used within this time will be forfeited with no entitlement to refund or exchange. It is not possible to extend the voucher beyond the stated 12 month validity period. 4, All vouchers must be booked in advance. 5, Vouchers cannot be used on certain holidays such as Christmas Day or New Year’s Day or certain promotional days such as Valentine’s Day or Mother’s Day. Please ask when booking. 6, Reservations are subject to availability, at our discretion. Please call the telephone number specified on the restaurant’s home page to make your reservation. Purchase of a voucher is not a guarantee of a reservation. 7, Vouchers can be used as full or part payment on goods and services at Estabulo Group Restaurants in the UK. Purchases made with vouchers are not refundable in cash. 8, Vouchers are not refundable in cash or replaceable if lost, destroyed or stolen. 9, All vouchers must be presented by the bearer on arrival (printed or via smart phone) at the relevant restaurant and must be mentioned when booking. 10, The company reserves the right to amend these terms and conditions without prior notice. 11, For technical queries regarding the website, shopping cart or receiving the vouchers please contact vouchers@estabulo.co.uk. please be aware that you cannot buy gift cards from the restaurant’s! after researching online the Estabulo web site states that gift cards can be bought in restaurants and on line, this is not true, after travelling into Wakefield to buy a gift card I was told that gift cards cannot and never have been available to buy in restaurant! when I told the member of staff that it said this was an option on the website he quickly told me it wasn’t, it was I replied and showed him the website which definitely said could be purchased in restaurant.so if you are planning to buy a gift card for anyone please beware, not in the restaurant!!! Gift Vouchers can be purchased at all our restaurants.